Land Rover’s latest Discovery enters the Australasian market with full five star safety ratings in competitive 4×4 environment. 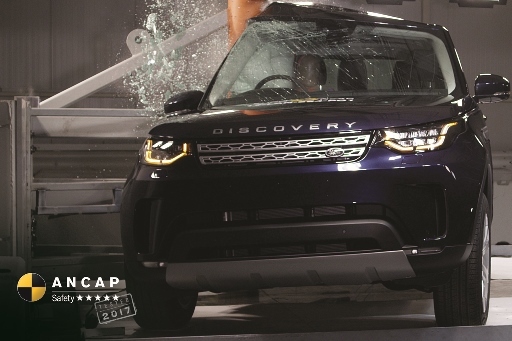 Tests conducted at Thatcham Research for Euro NCAP and the Australasian equivalent, ANCAP, showed good safety performance of the 2017 version of the Land Rover Discovery model. Assessed not only on its ability to protect occupants in the event of a crash, the big Disco also scored top marks in pedestrian protection, passive safety equipment and the increasingly important field of active safety technology. Passive safety, occupant and pedestrian protection are tightly linked and most of the major car manufacturers are beginning to get this aspect of the design right, resulting in high performance levels as demonstrated during the Land Rover test. Having provided an industry challenge initially, pedestrians are now gaining considerably more protection from life threatening injuries than ever before through simple innovations such as lowering rigid structural components  at the statistically most probable impact points. Technology also plays a role with such equipment as air bags and bonnet jacks. The global NCAPs (New Car Assessment Programmes) keep moving the goalposts to make the coveted five-star awards progressively harder to achieve without making significant inroads on safety and equipment levels. Air-bags and Electronic Stability Control have long been mandatory requirements. Next is Autonomous Emergency Braking (AEB) and other technologies are in the pipeline for driving progress in road safety technology through mandatory inclusion in assessment ratings. In this respect, the Land Rover Discovery has done well with a package of Advanced Driver Assist Systems (ADAS) included as standard, including AEB, Electronic Brakeforce Distribution, Emergency Brake Assist and Lane Departure Warning. Available optionally, the list of advanced safety features also includes Adaptive Cruise Control, Automatic High Beam, Blind Spot Monitoring and Tyre Pressure Monitoring. There was criticism however for making regional variations in standard safety equipment. With some safety features fitted as standard in European markets, Australia’s assessment organisation berated the 4×4 producer for providing the same features only as options in the Antipodes. Overall, the Land Rover Discovery scored 75% for pedestrian protection, 73% for safety assist technology, 80% for child occupant protection and 90% for adult occupant protection – achieving a particularly high score for the side impact pole test. As a result, the Discovery was awarded the full 5-Star ANCAP rating.